Universal wrench eliminates the need to carry special wrenches for all the different types of tubes. Specially designed to fit all of the most popular brands of choke tubes on the market today. SPECS: Steel, blued. 2" (5cm) long. 12 or 20 ga. only. Universell fastnøkkel eliminerer behovet for å bære spesielle skiftenøkler for alle de forskjellige typene av rør. Spesialdesignet for å passe alle de mest populære merkene av choke rør på markedet i dag. Spesifikasjoner: stål, blånert. 2"(5cm) lang 12 eller 20 ga. bare. 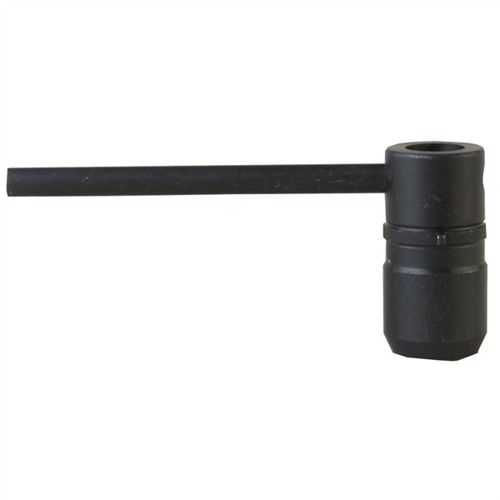 This wrench does not fit Mossberg factory 20 ga. choke tubes. The lugs on the wrench are too large to fit in the tubes' wrench notches. However, I was able to file down the lugs until they fit, and now the wrench works with the factory tubes. Tool broke first time I used it remove a choke tube. The lugs that fit into the slots in the choke tube are too small and break off easily. Tool broke first time I used it. Lugs that engage the choke tube are too small and break off easily. I bought this wrench to quickly install and remove choke tubes from my NEF Pardner Pump 12 gauge. This wrench (of course) works with all Carlson's choke tubes but will not work with the modified choke tube that was included with my shotgun. The notches on the choke tube were too narrow for the lugs on the wrench to fit into. I had to resort to the stamped steel Carlson's choke tube wrench to remove my factory original choke tube.